Having an anti-coconut husband has limited my baking with coconuts over the last several years. In the spirit of “absence makes the heart grow fonder,” I think I enjoy all that German chocolate-y goodness even more because I don’t have it very often. In this case, those nostalgic flavors are baked into pecan pie bars. If you’ve never made pecan pie bars, imagine those gooey filling and toasty pecans of pie fame filling a simple crust and baked in a big pan instead of a pie plate. Add to that a little cocoa in the crust, some melty chocolate on top of the crust, and stir in some coconut with the pecans. Now, we’re talking! 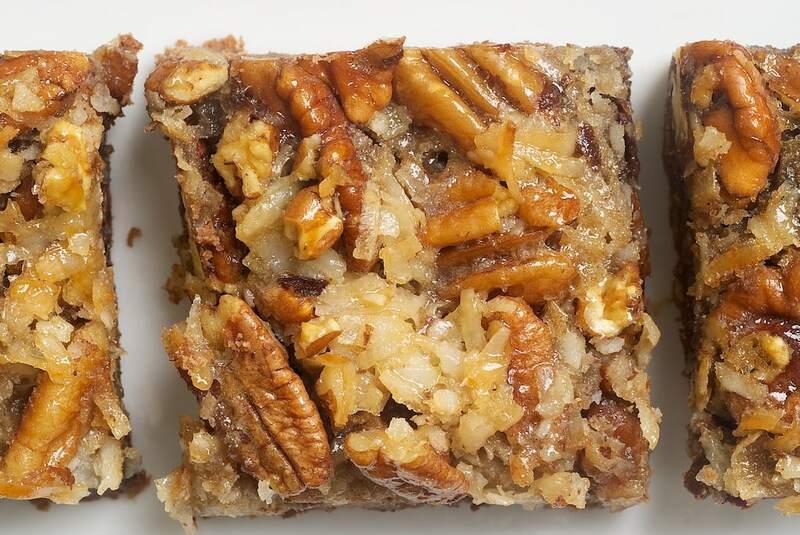 These are, without a doubt, the best pecan pie bars I’ve ever made. I am usually reluctant to throw out such accolades, but it is completely appropriate in this case. If you are a fan of German chocolate cake, then I think you’ll love them, too. If you don’t like coconut, you can just leave that out and add more pecans or maybe some chocolate chips. Love pecans? See all of my pecan recipes by clicking here. 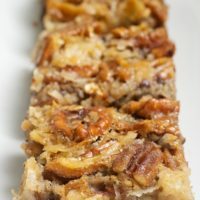 German Chocolate Pecan Pie Bars are a wonderfully delicious combination of chocolate crust, more chocolate, coconut, and pecans. A great crowd pleaser! Line the bottom and sides of a 9″x 13″x 2″ baking pan with aluminum foil, leaving an overhang on two short sides. Grease foil. Bake the crust for 15 minutes. Remove from oven and immediately sprinkle chocolate chips evenly over crust. Allow to cool on a wire rack at least 30 minutes. Place the eggs in a large mixing bowl, and beat lightly. Add the brown sugar, corn syrup, and melted butter. Whisk together until smooth. Stir in the coconut and pecans. Pour evenly over the partially baked crust. Bake 28-34 minutes, or until the edges are golden and the filling has set. Cool completely on a wire rack. Then, refrigerate for an hour. Using foil overhang, lift the bars from the pan and place on a cutting board. Use a sharp knife to cut into bars. *You can also mix crust ingredients in a food processor, but I prefer mixing this way. **Shortbread crusts like this one can be a bit tricky. The mixture will not hold together on its own, but it should hold together when pinched. Be sure your ingredient measurements are accurate, and press the crust firmly into the bottom of the pan. Wow, this sounds great! I’ve always been a fan of 7 layer bars, but I like the idea of these better because they have fewer ingredients so you can focus in the nuts, coconut, and chocolate! Shut the door! These look like they will quickly become an absolute favorite of mine. I love pecan pie and German chocolate cake has always been my favorite. My husband hates coconut too (who ARE these people?!) but maybe I can trick him into eating these. Oh my goodness! 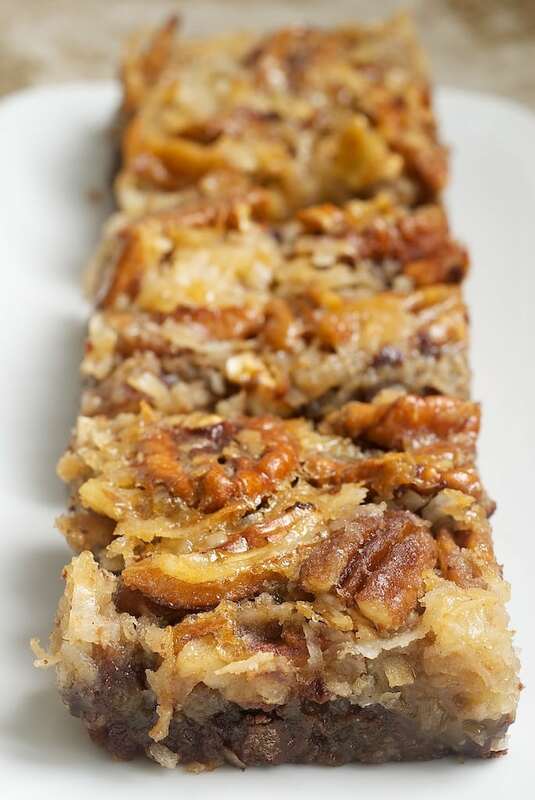 The German Chocolate Pecan Pie Bars are so seductive! The photos are just voluptuous, well done! These bars sound incredibly perfect for me with all my favorite ingredients. Delicious bars. Thank you for sharing them on RecipeNewZ! 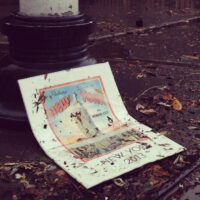 Everyone loved them and now you have one more RecipeNewZ feature: http://www.facebook.com/RecipeNewZ Congrats! Looks delicious! I would love to try some. I am sure it tastes great. i’ve never heard of german choclate cake, but i have heard of pecan pie! they look so moist and chewy and delicious. German Chocolate Cake. The mix does not do it justice…Buy a package of Baker’s (the brand)Chocolate. Oblong green package. The recipe is on the inside. They have simplified the recipe from the old days and is much easier. I have been making this same recipe for 50 years! So good. I made these bars last night and they were absolutely amazing! Perfect. Thanks for sharing the recipe! These were delicious. Everyone loved them. Can these be frozen? Thinking ahead to holiday baking. I’m wondering what size pan you used. Thank you! Michelle, you’ll need a 9″x 13″ pan. It’s in the 3rd step of the directions. Enjoy! Marla, pecan pies freeze well, so I would think that these bars would, too. I made these but didn’t know exactly what was meant by waiting until the filling was “set”. I left them in the oven all 34 minutes and the filling still “jiggled” a bit so I left them longer. The crust hardened. Please advise. Esme, baking until set means that there’s not a noticeable “jiggle” when you gently shake the pan. Keep in mind that residual heat will continue baking them after they’re out of the oven. Also, if you used a dark pan, the crust can get overbaked. Yum…combines two of my husband’s favorites AND involves several things I am allergic to, so perfect for spoiling him & getting credit for using coconut, pecans AND real butter (all of which I love, but do not love me!). Looks pretty easy, too! Lou Ann, you don’t have to use the foil. It just makes it so much simpler to remove the bars. You can generously grease the pan or use parchment paper. I used Greaseproof paper..can the Corn syrup be replaced by something else? ie Nectar Agarve is it thick enough? Yes these look fabulous minus the GMO corn syrup. Does anyone know first hand of a good substitute that works? Maple syrup would be a good alternative. I wonder if organic brown rice syrup would work instead. That would probably change the flavor a bit…it has a slightly caramel flavor to it. Maple syrup. Use the same amount as corn syrup. How long do these keep for? In the fridge or the press? Jodie, I would keep these for 3-4 days in a tightly sealed container. These look amazing!! My mom loves German Chocolate Cake and Pecan Pie…these would totally be her heaven! The cold butter used in the crust is that the same one used melted? Nisha, the cold butter is to be cut into the crust. The melted butter goes into the filling. How many pecans do you toast in the beginning, and how many do you use in the mix? I’m making these now and my house smells so yummie!! Can’t wait to get my families feedback on them… So easy too!! Toast all of the pecans. I just made these for Thanksgiving tomorrow and sampled the edges as I was cutting them. Delicious, although I may have slightly overbaked them. One thing that didnt turn out I think the way it was supposed to was the crust. As I used my pastry cutter to combine the butter into the dry ingredients I don’t think it got moist enough….anyone else know what I’m talking about? Yes it needs to be done in the processor to mix up then the butter melts to hold it together when you press it in the tin…. I had the same problem with the crust…too dry. I would adjust the flour to butter ratio next time. I would also add a pinch of salt since using plain flour, it’s amazing what a difference just a little pinch of salt makes in a recipe. Otherwise very good. Katie, you’ll need to toast all 3 cups of the pecans and then stir them into the filling. Jessica, I used a pastry blender for the crust and didn’t have any problem. It’s a crumbly dough, but it should hold together well when pressed into the pan. These were amazing! I am very picky, always looking for the BEST recipe for something. I have made good pecan pies before, but these bars are so, so good that this will be my go-to recipe for pecan pie from now on. They do taste a little like a 7 layer cookie bar. The crust is really good too. My mouth had an orgasam when I ate these not one not two but three I tell you three of these and each time I felt like my whole world was being rocked. This is one recipe I will be making again. Salivating, these look amazing. Can I substitute anything for corn syrup? Irene, you can try golden syrup. Made according to the recipe, and the topping was delicious, but I agree with one previous comment, the bottom lay was dry. Would do again with brownie bottom crust. Divine, just divine. 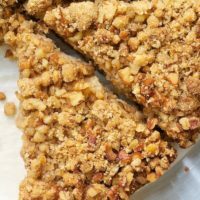 I used white whole wheat flour in the crust and only had 2 cups of pecans so I added 1 cup walnuts as well…totally yummy. I find the crust on the not too sweet dry side is the perfect compliment for the sticky sweet ooey gooey topping. These were awesome will be making again real soon.It’s not very often that my husband says I should have made a double batch of something but he sure did for these lol. These are SOOOOO good. Loved them and they were definitely a hit with my family, but the crust is really crumbly. I know it’s not supposed to be kind of like that, but it feels like the butter and the flour, cocoa, and sugar didn’t mix at all. It pressed into the pan just fine, but it literally gets everywhere. Anyone have any ideas on how to make it just a little more moist? Erin, the crust can be a bit on the crumbly side. If it’s not holding together when you mix it, you could try adding a tablespoon of water, mixing, and then pinching the mixture to see if it holds together better. If necessary, you can repeat with a tablespoon of water at a time until it holds together better. I wouldn’t add more than 2 or 3 tablespoons of water total. Hi, Debi. They’re listed in the recipe – 3 eggs and 3/4 cup corn syrup. Sounds great but I can’t find in recipe where the chocolate chips are added. The problem isn’t mentioned in comments (that I can see) so is it me or did you omit this part? Hi, Kim. The chocolate chips are added in the 5th step right after the crust has baked. Hi, Bobbie. I have virtually no experience with converting recipes to gluten free. If you look for some information through a search engine, you’ll find lots of knowledgeable people with lots of advice like these tips from Gluten Free Goddess. @Bobbie I used Coconut flour TIANA and Vital Protein flour Gluten free as opposed to wheat which is extremely high in Carbohydrate… replaced the Syrup with Nectar Agarve Light lo Carb. Anxious to make these, but I’m curious about why use light brown sugar vs the dark brown. What is the difference? Maria, dark brown sugar has more molasses than light brown sugar, so they taste slightly different. It’s really a preference thing. If you’d prefer to use dark brown sugar, it will work just fine. LOVE THESE! I’ve made these multiple times over the last year. My husband is probably the #1 fan of these bars! I want to know if I could use a springform pan and bake it as a one whole dessert ? Hi, Mariafe. I think it might work. You’ll likely need to half the recipe, as the volume of a 9″x13″ pan is about twice as much as that of a standard 9″ springform pan. Looks delicious, but I don’t like corn syrup. I wonder if honey would work as a substitution. Eliza, I’ve not tried it in this recipe, but honey is generally a good 1-for-1 substitute for corn syrup. These are delicious! I made them tonight and can’t wait to share them with friends tomorrow night! 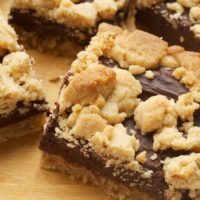 Can I use German Chacolate cake mix for the crust? Hi, Katie. I suppose you could. It will be quite different than the crust in this recipe, though. Can I use a Pillsbury pie crust? I’ve not tried that, Shelly, but my guess is that it would be fine. Keep in mind that this is a sweetened shortbread crust, so the overall taste will be affected. I just made these an forgot to grease my foil…..kinda nervous how it will turn out. Why not make them gluten free and low glycemic? Just use gluten free flour and coconut sugar. Wondering how they got the German Chocolate name in the recipe. I was shocked to read and it didn’t include any GERMAN chocolate—only cocoa & semisweet chocolate chips! Fern, my guess is that it’s just a take on the flavors of German Chocolate Cake. German chocolate is a version of semisweet chocolate that usually has a higher sugar content. As far as I know, there are no German chocolate chips produced, so semisweet is the closest option, especially if you can find a low cacao percentage product. 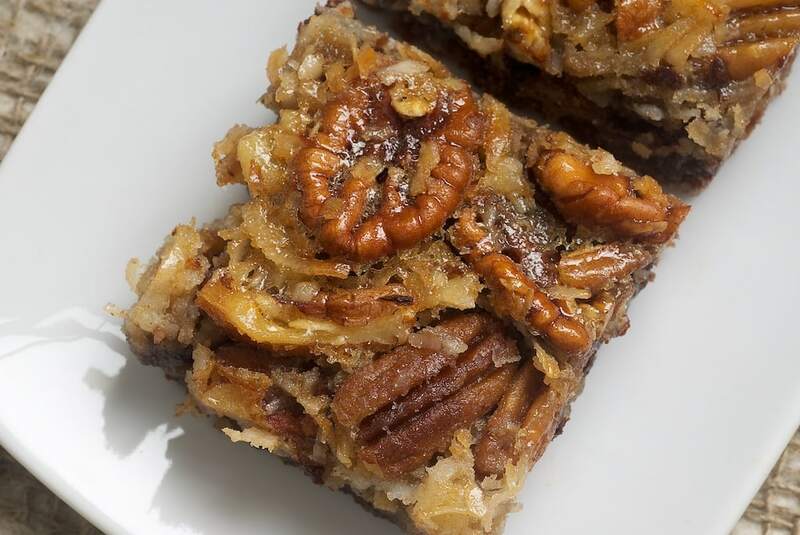 Jennifer, one of the main ingredients in German Chocolate Cake is the coconut so that plus the chocolate (even if it’s not designated German Chocolate) is reason enough to call this German Chocolate Pecan Pie Bars. I also have an anti-coconut hubby… but he is anti-nuts-in-baked-goods too. It’s a texture thing, he likes coconut flavor, and he will eat mixed nuts in a bowl. What’s really weird is he likes the gooey part of pecan pie, just not the pecans. Anyway, do you have any suggestions on what this might taste like without coconut and pecans? I’ll bet it’s still amazing, but I get the feeling it will taste like a sugar-overload without the texture. Thanks! I SURE hope these are good! I’m going to make them for my church potluck! Looks like a winner to me! Gonna try this soon. German Chocolate cake is my favourite cake and Pecan Pie is my favourite pie. Best of both worlds and a win-win from any angle. Confectioners sugar(powdered/sugar?). Not regular sugar? Yes, it has a finer texture that works well for the crust. After you sprinkle the chocolate chips on the hot crust, do you spread them completely over the crust or leave them whole? Can’t wait to try this recipe! Hi, Julie. Just sprinkle them over the crust. No need to spread them. Too much corn syrup that oozes out and makes it a bit sweeter than it needs to be. Very tasty but will reduce syrup to about half the amount next time. Also, someone commented about the crust being too crumbly – I totally agree, I added 2 tablespoons water to the mix and it worked perfectly. I am making these right now — but am concerned. I used a food processor to mix the flour, p. sugar, cocoa and butter. It never became “course”… it is like DUST. I checked and went online, everything, they all say 3/4 C butter. That can’t possibly be right. I baked it and it is cracked and dry..like dust. Will this be ruined??? Should there be more butter to make the crust??? Hi, Terry. The crust should work as written. I’ve never had any problems with it. Did you weigh your flour? If not, maybe you had a bit too much and that prevented it from holding together. Also, I’ve not made this crust with a food processor, but I think that wouldn’t be the problem. Definitely seeing these in my future! Thanks for sharing! I am getting ready to make these for the 2nd time. They were great! I intend to again follow the recipe exactly. I admit that I was also worried about how crumbly the crust seemed when patting it into the pan, however after baking it was perfect. This is a great recipe. I made these today and was disappointed. Crust was dry and bitter. Top didn’t hold together. Any suggestions? I’m sorry to hear that! Bitter makes me think it was your cocoa powder. Make sure it’s fresh. If you didn’t make any substitutions or changes, I don’t know why the topping wouldn’t hold together. Maybe add just a little more corn syrup? I would like to make these for a function on Thursday night but I want to make them on Monday before I leave to go out of town. One, will they still be good? Two, can I leave them in the fridge uncut till Thursday? Or do you have another suggestion to preserve from Monday to Thursday? Hi, Barbara. These keep for 4 or 5 days, so I think yours will be fine if kept tightly covered. For all the diabetics, suggest you substitute sugar with Splenda. You can buy both white and Brown Splenda. Its sweeter than sugar and you really can’t tell any difference. Has anyone tried NOT including the chocolate chips on top of the crust. To me, the dessert was so sweet I couldn’t enjoy it as much as I thought I would. I think leaving the chocolate chips off might help, but not sure how it would effect the consistency, or if they are necessary for some reason. Sheila, you can omit the chocolate chips if you like. 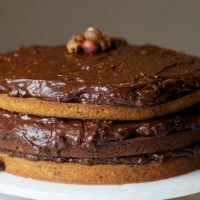 I made this last night, I did over bake by a few minutes, I only used one cup of chips as I used 63% dark chocolate, but I must say YOU came up with the most amazing recipe!! This will play hell for my diet, but oh so worth it!! So glad you liked them! I wish I could take full credit for this wonderful recipe, but you’ll see in the notes of the recipe that it’s a slight adaptation of a Southern Living recipe. I was wondering if you couldn’t substitute shaved German Chocolate for the choc. chips? I love the flavor of G.choc. Hi, Susan. I think that should work just fine! Patricia and Jennifer — high altitude baking. You have to be a little more careful when it comes to baking cakes (any kind — ie, regular, bundt, sponge, Angel Food, etc.). Depending on the ingredients as to what amount you change for what ingredient. You can always contact the County Extension Office. I’ve never had to make any adjustment for bars, cookies, muffins, whatever in all the years that I’ve lived in Colorado. I am thinking about making this but want to omit the powdered sugar from the crust. Should I just omit it or boost the flour to make up for the missing sugar volume? Kelly, I wouldn’t recommend leaving out the confectioners’ sugar. Your crust won’t be very tasty without something there to sweeten it. Hi! 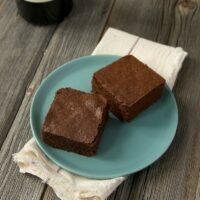 I’m actually hoping you or someone can answer if you know rather quickly, because I intend to make these tomorrow, but what effect will using SALTED butter on it have? Or would it really ruin the flavor?? Stephanie, it will just be saltier. You can decrease the salt elsewhere in the recipe if you like. There’s not any salt in this recipe, though…. But yes, normally I would decrease the extra added salt if salted butter was used. But here there is no added salt. That’s true, Stephanie, although you might want to use unsalted pecans. Either way, the only difference in using salted butter is just the added salt. If you like a little salty with your sweet, then you should be just fine. Enjoy! My husband is a pecan farmer in NM, and I am always looking for new ways to use pecans. My mother always made the best German choc cake and pecan pie, so this is a great mixture of the two. I’m trying these this week. While these were delicious, they were also very messy. They oozed corn syrup, which dripped as they were eaten. A plate is a must. Even while cold they were still messy. Did not have this problem. They turned out a delicious finger food at room temperature. Just a little finger wipe with a napkin after eating. Yum! I love pecans and Pecan pie has always been calling my name but the couple of times that I tried it, it was way too sweet for me. I have a problem with foods that are too sweet. I love the look of these bars and would love to try them but I was wondering if there is any way to make them not so sweet? Can I just eliminate the corn syrup or replace it with something like cream cheese? The corn syrup helps hold them together, so I’d be hesitant to eliminate it. You could dial back the brown sugar a bit and use unsweetened coconut. fabulous recipe. Thx for sharing. Looks delicious and will be making for Thanksgiving dessert. Someone from etsy actually uses your pictures and some of your blog too just so you know. Thanks for letting me know, Terry. I’ll look into it. Happy Thanksgiving! Just put my batch in the oven! I got a little excited and didn’t remember to cool the crust, but just dumped the topping right on! Oops! We’ll see how this goes! Hi, I’m about to try this and I live in Thailand. We have fresh coconut flakes here, do I need to dry them out first in the oven or can I just throw it? They will have a bit of moisture to them as they are shaved straight from coconut meat. Thanks. Hi, Nga. I’ve only rarely baked with fresh coconut, but you should be able to substitute it. It will just be less sweet than the kind listed in the recipe. Just made today to bring to thanksgiving dinner. My husband is not a desert guy, but he said perfect. Friends coming over tomorrow. Sure hope that these last till thanksgiving so I don’t have to make another batch. Delicious !! Really great and surprisingly not too sweet. Will definitely make again and again!! Decided to make these tonight for Thanksgiving dinner tomorrow. Went to the store and bought all fresh ingredients. Very disappointed. The crust was nothing close to a crust. Looked more like a powder. Thought I did something wrong so I tossed it out and started over. Next try I got the same results. Crust nothing like a crust, more like cocoa powder and yes my butter that I cut in was cold, right out of the fridge. When I came back here to see if anyone had the same problem I did, I did see where people with the same problem were told to add water to the crust mix. I wish I had known to do that before throwing out the second batch. Maybe a note at the end of the recipe would help people who are experiencing this problem. I was afraid I would have problems with the powdery mixture that was to be the crust because of comments I had read. When I started pressing the crust into the pan it seemed to just be powder, but as I pressed harder it began to stick together. I kept pressing, hard, until it was mostly stuck together and a very solid firm layer in the bottom. It turned out perfectly and was delicious. I think the people having problems may not realize that you really need to work at pressing the chocolate crust firmly until it sticks together and is very solid before baking. I’m not sure why some people are having issues with the crust. I made the recipe this morning exactly as written (with the exception of the coconut that I forgot to add lol) and though I had my doubts because it was very dry looking and crumbly, once it was baked it was perfect. The butter melted evenly and created a lovely crust. I made this as a test run for my Christmas baking and it is definitely a winner! Even without the coconut it is decadent and delicious! Thank you for such a great recipe! I’m so glad you liked them, Jane! I made these for Thanksgiving and they turned out perfect and delicious, a nice compliment to the selection of pies. Because of some comments about the crust being powdery, I paid extra attention to this step. I found that you need to patiently keep pressing the mixture firmly into the baking pan until it grabs and holds together. If you just give it a quick press, I assume it will not hold together after baking and will be powdery. I spend several minutes on this step and it turned out perfectly. Thank you so much for this recipe. We loved it! Thanks so much, Sandy! I’m glad they were a hit! Hi, made these. They were pretty easy to do.I did have a little trouble getting the base for the bars to actually press in and stick to the pan. Next time I will use a little additional butter or water as suggested. It did come together while it baked. These were delicious. Even some of our family members who are not Pecan Pie fans really liked these. Will definitely make again. Thank you so much for sharing. It is so nice to be able to have access to people like you who are so talented in the kitchen. Your talent rubs off on all who use your recipes and makes us ” talented ” to the important people in our lives. Thank you. Thank you, Pixie! You’ve made my day! 🙂 I’m glad you and your family enjoyed the bars! I’m glad they were a hit, De! We’ve (my 4 year old daughter and I) made this twice now. The first time we cut the recipe in half…that was a mistake! These bars are so delicious! They’re unassumingly balanced in sweetness. So we made them again today without cutting the recipe in half and still a winner! The only difference this time is that we made them gluten free by using corn starch. And still they came out great. Just be sure to cut the flour recipe in half for the corn starch. Thank you for this recipe! 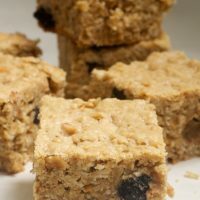 I have an old taste of Home Recipe that is a whole lot like this except it has crunchy peanut butter instead of pecans. It’s one of my fav’s. So I thought I’d give this one a whirl. I did pour the filling on it hot and bake it right away, for a little less time. I didn’t see any point in letting it cool and then making it hot again. And mine are a great texture now so it worked for me. Also I added a pinch of salt to the filling. I will definitely make this again. Thanks for the recipe. Ps. I didn’t have any trouble with the shortbread amounts like some did. Mine was just just the right amount of crumbly. Is it possible to substitute honey for the corn syrup? Thanks. Hi, Joann. I’ve not tried that substitution. It might work, but keep in mind that it will alter the flavor. If you have access to agave syrup, that might work better. Substitute corn syrup with a home made version. In a sauce pan add the sugar and cornstarch and the bit of salt stir it to combine all..
Add the water and turn on heat. Swirl pan to dissolve the sugar mixture. Bring to a boil and bring sugar mixture to a temp of 240 degrees F. soft ball stage. And I will be making these bars this weekend! Tried these tonight … not that that are bad but they do not taste like any German chocolate cake that i have ever had. I would not make them again. These sound fabulous and will definitely have a place at our Thanksgiving dinner. Have you ever tried making them ahead and freezing them? I like to get a head start on all the Thanksgiving cooking and baking. Hi, Dona. I’ve not tried freezing them, but I think they’d be fine. Just wrap them really well before freezing. Not sure what happened but the corn syrup layer never set even after baking for an extra fifteen minutes. The whole inside of the pan was extremely soupy. Not sure what I did wrong but seeing as how there has been success and no one mentioned this problem I guess I will try again. I have never made pecan pie filling without getting it up to a boiling temperature before using. I don’t know why it didn’t set but it was hard tossing all those good ingredients in the trash. Any idea what I may have done wrong? I thought I followed the recipe exactly but a mistake must have occurred somewhere. I’m sorry you had troubles! The filling doesn’t need to be boiled. I always make pecan pie filling in a similar way to this recipe. If you didn’t change anything about the recipe (including using low-fat or non-fat ingredients, or margarine instead of butter) and your ingredients were all fresh, you might check your oven’s temperature accuracy with an oven thermometer. I’ve never been a fan of cake ~except for my pound cake~ but I LUV the German chocolate topping. Every year my mom gave me a jar of the frosting for my.birthday and Christmas, the best gift of all!! Do you store out or in fridge? If they won’t be eaten with a few days, I’d refrigerate. Just made these and thought I’d share a TIP FOR THE CRUST. After cutting in the butter with a pastry cutter, get your hands in the mixture and with palms together, rub the mixture hard between palms, back and forth, like you are washing your hands but with the mixture in-between. Keep going, and before you know it, it will be perfectly blended. This is called “sheeting” I believe. I read it in a pastry cookbook, under techniques to make buttery pastries. Excellent recipe! I’m glad you liked them, Mary Kay! Thanks for sharing your tips. Hello.. I tried these and they turned out awesome.. I wanted to know if there is an egg free version also,as someone allergic to eggs wanted to try them. Can you pls suggest.. thanks.. Thanks! I’m a pretty traditional baker, so I don’t have much experience with baking for special diets. There are several recommendations for egg substitutions. I would suggest trying one with which you are familiar. If you do any experimenting, please let me know how it goes!